Find and consult the Augur of Dunlain. Find the Augur of Dunlain. After your conversation with Urag gro-Shub about the newly recovered books, the librarian suggests you speak with Tolfdir about the findings. 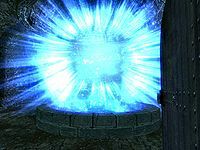 Tolfdir can be found in the Hall of the Elements, in deep rumination about the orb from Saarthal, or the Eye of Magnus. Let him know about your findings and he will begin to discuss the Eye with you. He will explain how the markings seem to be unique, as they do not appear to be Elven, Daedric, or Ayleid. Ancano will interrupt Tolfdir's musings and demand that you follow him to meet a mysterious visitor who has asked to speak with you. Follow Ancano to the Arch-Mage's quarters and you will meet Quaranir, another representative from the Psijic Order. Quaranir will freeze time in order to speak privately with you. He will explain that you must prevent anyone from using the Eye of Magnus, as he fears the consequences its misuse will bring. He will suggest that you seek out the Augur of Dunlain within the College, who may be able to give you better guidance. Quaranir will then unfreeze time and leave, confusing Savos and angering Ancano. Speaking to the various mages about the Augur will lead you to either Tolfdir or Mirabelle Ervine for more information. Tolfdir will tell you about the Augur immediately, but you must pass an easy-level Speech check to convince Mirabelle. Either way, you will learn that the Augur is a former student at the College, but something befell him as a result of his own ambitions. He can now be found in The Midden in his altered state. You can access the Midden from a trap door in the northern corner of the courtyard or by the stairwell in the Hall of Countenance. Making your way to the Augur of Dunlain is relatively easy; you will likely encounter a few ice wraiths and frostbite spiders, along with a small number of draugr and skeletons. Proceed into The Midden Dark and continue until you reach a locked door. When you approach it, the Augur will warn you from the other side that your efforts will only end in disappointment. The door will then open. The Augur will inform you that others (including Ancano) have previously sought information about the Eye of Magnus without realizing the dangers it poses. While the Augur speaks only of disaster for the Thalmor, he seems encouraged by your path and offers to help you further. He will then inform you that you will need the Staff of Magnus to avert the disaster the Psijics warned you about, and urges you to share this information with Savos Aren. Speak to Savos and inform him of the Augur's message. It takes a bit of convincing to get Savos motivated and interested in this turn of events. Eventually, he will direct you to Mirabelle Ervine for more information on the Staff and then give you the Mage's Circlet, impressed with your performance thus far. 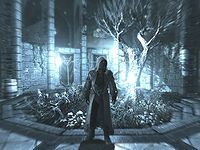 If you follow Quaranir out of the College after he freezes time in the Archmage's Quarters, he will walk through Winterhold and enter The Frozen Hearth, but never appear inside. You may not get the next quest "Revealing the Unseen" after completing the quest. This appears to be permanent and cannot be fixed by reloading. As the quest does not load, Mirabelle will have normal dialogue and the quest is impossible to begin. When you enter the Arch-Mage's quarters and go upstairs, time may stop yet Quaranir is not there, and you're stuck forever. Open the console command and manually advance via setstage MG04 40. Quaranir supposedly spawns far from Winterhold, using the console command prid 0002BA3D and then moveto player, this will move him to the College, and the quest should proceed normally. Ancano may not open the door to the Arch-Mages Chamber and lead you there. ? Open the console command and manually advance the quest stage by entering "setstage MG04 30" (without the quotation marks). The quest marker above Ancano's head should disappear. The door to the Arch-Mages Chamber should be unlocked. Now you are free to talk to the Psijic Monk and continue the storyline. 15 I've mentioned the Night of Tears book to Tolfdir, who seems distracted by the orb from Saarthal, and has some additional thoughts about it. 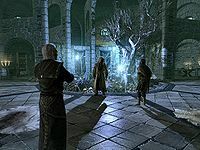 50 After speaking with Quaranir from the Psijic Order and being warned of the danger of keeping the Eye of Magnus at the College, I sought out and talked to the Augur of Dunlain, who lives in the Midden underneath the College. The Augur told me that I'll need to find the Staff of Magnus, and to give that information to my superiors immediately. 200 Finishes quest After speaking privately with a monk from the Psijic Order, I have been warned that the "Eye of Magnus" is potentially dangerous and must be dealt with. After consulting with the Augur of Dunlain beneath the College, I have brought word to the Arch-Mage that the Staff of Magnus needs to be located. The following empty quest stages were omitted from the table: 0, 60. On the PC, it is possible to use the console to advance through the quest by entering setstage MG04 stage, where stage is the number of the stage you wish to complete. It is not possible to un-complete (i.e. go back) quest stages, but it is possible to clear all stages of the quest using resetquest MG04. This page was last modified on 22 March 2019, at 14:03.